While I am absolutely loving my experience with ETMOOC, I am about to try my first run at an xMOOC. Tomorrow, I will begin a HarvardX course, HLS1x: Copyright. I am excited. Copyright is a topic that I have been chasing on my own for a few years now and one where I think that educators must have greater command. It seems professionally irresponsible to remain ignorant on the subject anymore. Moreover, while I like Creative Commons, I reject it as the safe and easy option as it is routinely presented in the edtech arena. On the most fundamental level educators need to now more about copyright not only to help ourselves and students avoid infringement, but exercise our rights to fair use and resist the longstanding encroachment on that provision. I have long admired the work of Renee Hobbs and her Media Education Lab, now at University of Rhode Island. For any educators keen on learning about copyright, I recommend you start there. Yet, this Harvardx class will be a much deeper dive into the subject than Hobbs’ must-read Copyright Clarity. It is a course being offered via the Harvard Law School for one. Plus, the list of guest speakers is impressive, including the likes of Lawrence Lessig and Shepard Fairey among others. In spite of my excitement, I must admit that I have developed a bias for the cMOOC variety. Of course that is what I know best, having engaged in about six or seven of them with varying degrees of success. So I am reserving some judgement but wanted to start some comparing them for my own understanding as much as anyone else’s. ETMOOC is fostering such a magnificent community of open-thinking educators from all teaching levels and tech savviness. Loosely connected as a “course,” it is warm, inviting, and filled with innumerable learning opportunities. It is a grand invitation to self-directed wayfinding in a virtual space that hinges on a hashtag. Focusing on education technology, which is much broader and already begun tangentially addressing the legal concept of copyright, the experiences between the two are already so different. While ETMOOC is completely open and proving to be quite adept at building a massive tent to include all those who wish to participate, HLS1x: Copyright was subject to a pretty serious winnowing process. Thousands of applications were submitted for only 500 spots. So I guess I got pretty lucky. I certainly feel that way. Upon the invitation letter to join the course, however, there was a four part follow-up to secure the spot, including a 20 minute pre-test. As one of the 500, I am already subdivided into a section of 20, complete with a juris doctor teaching fellow to lead the group, a bit different from the conspirators of the ETMOOC variety so far as I can tell. I have already received a handful of preparatory messages and documents prior to the class start. At the conclusion of the course, I am invited to take a four hour written examination. If my performance in the discussion forums and on the exam are satisfactory, I can earn a certificate of completion. It is a given that these two MOOCs are very different. HLS1x: Copyright is a course that really is primarily about content. ETMOOC is less about content and more about discovery, in a variety of forms. Both are genuine opportunities for deep learning and professional growth. Yet, I can’t help feeling a bias in favor of the xMOOC, even if I might be falling prey to it. The level of commitment that is being requested in the HarvardX is formal, demanding, and leverages the prestige of Harvard University. It is highly focused on the accrual of knowledge, includes an already potentially intimidating test, and even offers a credential, for whatever that is worth. All of these factors led me to ask my employer for some professional development recognition upon completing the course, as if I was taking a typical graduate course. Graciously, the decision maker in my district granted the request. However, I cannot imagine that the same administrator would have gone for the similar request regarding a cMOOC. Eventually, I will make a the same plea, but figured this xMOOC wasn’t too far of a departure from the known way of doing the business of education. Plus, living in the Boston area, Harvard has even more clout, helping my pitch. Still, I wonder which experience will ultimately prove most valuable to me. ETMOOC already strikes me as the kind of experience that may have much longer legs than its scheduled 11 weeks. I am waiting to see what HLS1x: Copyright holds. I will be interested to see what kind of community is created in the course, especially among the cohort of 20 to which I now belong. On a side note, part of my cMOOC fancy has to do with my increasing aggravation at how much the mainstream press has for the most part completely disregarded them, instead lauding the revolution of the prestigious and for-profit ventures. Friedman’s piece in today’s New York Times is just another egregious example. It is as if cMOOCs never really existed or at least those reporting aren’t even aware of their existence. Almost all of the press coverage advances a bias about education that I will have to return to in a separate post. Safe to say, the bias is what influenced my effort to pitch my employer on the xMOOC for credit over the cMOOC. Friedman’s understanding articulated in “Revolution Hits the Universities,” with its courting of Coursera isn’t nearly as revolutionary as Couros, or Siemens, Downes, Cormier, Groom, Levine, and all the other practitioners of this new educational phenomenon. At some point, I hope to press the case that the experience offered in a cMOOC is just as valuable, arguably more so, and just as deserving of consideration for some means of professional development recognition, regardless of whether it is affiliated with a credential granting scheme or university, prestigious or not. This entry was posted in Learning, Teaching & Learning and tagged Alan Levine, Alec Couros, cMOOC, copyright, Copyright Clarity, Coursera, Creative Commons, Dave Cormier, ETMOOC, George Siemens, Harvard University, HarvardX, HLS1x: Copyright, Jim Groom, Lawrence Lessig, Media Education Lab, MOOC, Renee Hobbs, Shepard Fairey, Stephen Downes, Thomas Friedman, University of Rhode Island, xMOOC on January 27, 2013 by Fred Haas - @akh003. With ETMOOC now two weeks old and almost half way through Topic 1: Connected Learning (Tools, Processes & Pedagogy), things are truly starting to take-off. It will be fascinating to see how long the legs last. I am hoping that it remains strong. What is so great about what Alec Couros and crew are creating is the sheer range of participants. Of course this could be said of all MOOCs. Yet, this particular one seems to have a magical mix of educators, a number of seasoned, tech savvy established types and a whole lot of fresh, eager to experiment types, cutting across all grades from elementary to university. It is an impressive movement to track and participate. I must admit that my MOOC experiences have been more of a gradual escalation. A few years ago, when this thing really got going, I was so fascinated and eager, but so quickly overwhelmed. It took a number of experiences for me to really feel like I had better set of bearings and could negotiate between my lurking and my participation. When it comes to MOOCs, my desire often has outpaced my will. Plus, I have been involved in a for-credit graduate course more months than I haven’t over the past three years, if not more. Combined with my teaching load, I kept getting to a point where I just got too bogged down to continue. Despite the best of intentions, once I lost my momentum I always felt like I was in a insurmountable hole and already missed too much to get back into the mix. Yet with each experience, I started getting better and better, like tracking things with better filters, managing the amount of time I could engage more effectively, and catching my breath when I needed without completely disengaging. By the time I jumped into #DS106‘s Camp Magic Macguffin, I started feeling like I was more successful MOOCing it. I had l already “finished” a MOOC at that point, although I have never been the most regular or consistent of bloggers. Even though I did have to stop participating in DS106 towards the end of the run, as a host of responsibilities needed more immediate attention, I felt really good about what I had accomplished. However, that was definitely the first experience where I truly felt that I was in a course that was more of a community. Those University Mary Washington peeps have really built something awesome with A Domain of One’s Own. 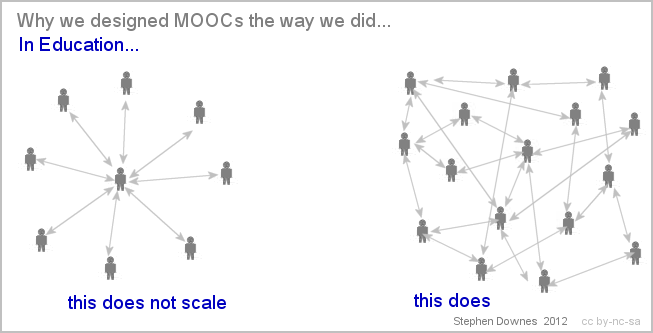 The coolest thing I can say about ETMOOC is that it already has the same kind of feel, more community than course. Sure it is loosely distributed and might not have all the trappings of the DS106 machine, like the Daily Create or Assignment Bank, but it has so much potential and the same kind of vibe. After all, ETMOOC is a really the evolution of the EC&I 831 open course experiment Couros conducted at University of Regina a few years ago. Given that short but significant legacy it doesn’t seem like a great leap to see DS106-style components developed and potentially built off ETMOOC as a platform. That too would be pretty awesome. So despite all of the competing claims on my attention, I can’t help but want to stay connected to this thing that is happening. One of the beauties of ETMOOC is that each topic runs two weeks, almost ensuring that anyone can catch their breath along the way. That two week window is probably the one thing that has me feeling the best about staying involved and might be the master stroke for me in the planning and execution of this MOOC. This entry was posted in Learning, Teaching & Learning and tagged Alec Couros, Assignment Bank, Camp Magic Macguffin, DS106, ETMOOC, MOOC, The Daily Create, University of Mary Washington, University of Regina on January 25, 2013 by Fred Haas - @akh003.